Our fitting room systems are flexible enough to handle any size, any season, and any fashion trend. With modular design and quick assembly, you can easily create a changing area tailored to your specific store layout—big or small—and reconfigure it as necessary to meet demand. Plus, with multiple shelving and accessory options available, you can merchandise the outside walls to extend your sales-floor space! At Madix, we don’t believe in “one size fits all,” especially when it comes to shoe displays. Mix and match thousands of standard, cataloged parts to create a custom fit for your store! Make your planogram changes quick and easy with our large selection of retail apparel racks. 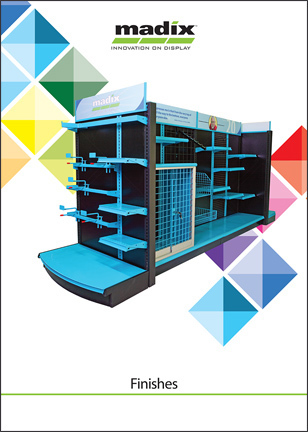 These freestanding racks are multipurpose, ultra-mobile, and robust solutions to a variety of apparel-display challenges. Madix’s Luxe Queuing features rounded, four-slotted posts that not only create a more modern look, but also let you build the unit in multiple directions to fit your store’s layout. See how Madix’s store fixtures can help apparel and shoe retailers create bold, original displays. Madix understands apparel and shoe retailers. A leading innovator in the store-fixture industry, Madix has a history of successfully helping apparel and shoe retailers solve their merchandising challenges. LEDge Light is the first LED lighting product designed specifically for use on display shelves. No electrician required! The patent-pending LEDge Light Versa system allows retailers to quickly and easily reposition lighted shelves without the hassle of unplugging and reconnecting electrical wires. Lumibacks can replace standard back panels in Madix’s fixtures to create additional lighting or to provide a backlight for large-format, duratrans graphics integrated with the display.